TS PGECET 2019: TS PGECET is a state level entrance exam which is conducted by Osmania University, Hyderabad for the purpose of granting admission in various post graduate courses. This Common Entrance Test includes the admission in PG courses in Engineering, Technology, Architecture, Pharmacy and Planning such as ME / M.Tech. / M.Pharmacy / M.Arch / Graduate level Pharm-D (Post Baccalaureate). All the official details about TS PGECET 2019 has been released on the Telangana State Council of Higher Education (TSCHE)’s official website pgecet.tsche.ac.in. 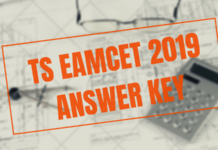 To fetch more details on TS PGECET 2019, candidates must scroll down to the below article. Latest: The Application Form for TS PGECET 2019 has been released. Scroll down to Apply. 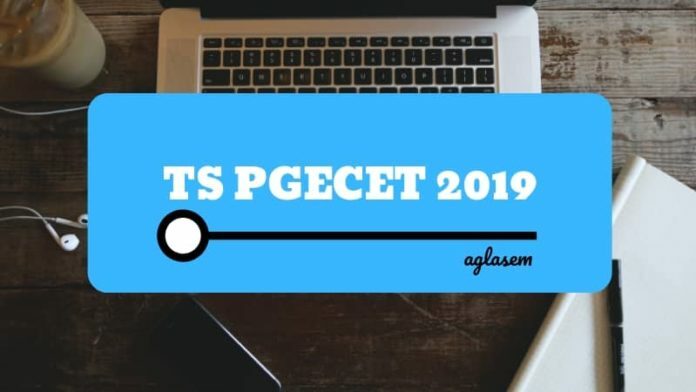 The official dates for TS PGECET 2019 have been released by TSCHE and that is from May 28 to May 31, 2019. The entrance exam will be conducted in two shifts morning (10 AM to 12 PM) and evening (2 PM to 4 PM). The entrance will be computer-based and there will be no negative marking on the incorrect responses. Candidates can refer to the official schedule given below and stay updated about the deadlines and examination dates. To apply for TG PGECET 2019, candidates must make sure that they are fulfilling the eligibility criteria prescribed by the TSCHE. 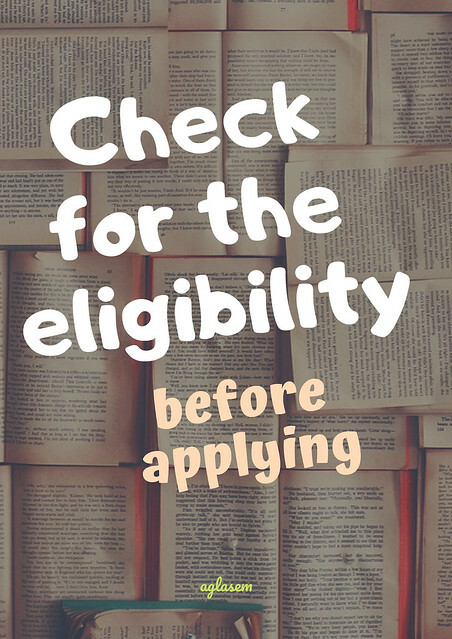 Candidates can check out the eligibility conditions given below. Click Here: To know more about the eligibility criteria of different courses under TS PGECET 2019. Osmania University, Hyderabad has released the application form on the official website pgecet.tsche.ac.in. The application form is available online mode only, No post in person regarding the commencement of online registration will be sent to any subscribed candidate. In the application form, candidates will have to fill in the details such as personal information, contact details, educational qualification, and many more. Through the online registration, candidates will get a particular Login ID and password. IN order to apply successfully candidates will have to pay an application fee as per the fee is given in the table below. Candidates shall be able to pay the registration fee through Debit/Credit card if any Indian authorized bank, Net Banking, TS Online or AP online as well. 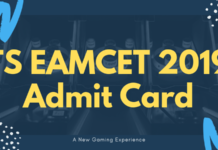 The admit card of TS PGECET 2019 will be released on May 21, 2019, before the entrance examination. Candidates are advised to preserve their hall tickets until the admission procedure gets over. In the PGECET hall ticket, candidates can see the details printed such as exam date and time, test centre, important instructions to keep in mind while giving the exam, and many more. No entry will be allowed at the allotted exam centre without the admit card. In case of any discrepancy in the hall ticket, candidates must contact the conducting body’s concerned authorities to resolve the matter as soon as possible. Before going to start the preparation for the concerned examination, candidates must check out the exam pattern constructed below. The exam pattern will help the appearing candidates to get to know the marking scheme, number and type of questions, exam duration and many more. As there are many fields covered in TS PGECET, so candidates must check out the syllabus for each and every course. Only those topics which are included in the syllabus will be coming in the entrance examination. Osmania University, Hyderabad will release the official answer key as well as the question paper on its official website after the examination. Candidates will be able to evaluate their result by referring to the declared preliminary key. To calculate the marks, candidates must know the marking scheme prescribed by the concerned authorities. Meanwhile, the unofficial answer key will be available right after the entrance examination. It will be released by various coaching centres and educational portals on their official websites. TSCHE will publish the result of the appearing candidates in the form of the Rank Card. The TS PGECET 2019 result will be accessible on the official website pgecet.tsche.ac.in only. To access and download the rank card, candidates have to fill the asked credentials diligently on the candidate portal such as Registration/Application Number, Hall ticket Number and Date of Birth. The University will not send any rank card by post in person. The first preference for the admission in the concerned programs will be given to those who have qualified GATE/ GPAT for the following academic year. If the seats still remain vacant then the qualifiers of TS PGECET 2019 will be considered for the same. TS PGECET-2019 will be conducted in the following two regions. Hyderabad North (Medchal,Gandimaisamma and surrounding areas). Hyderabad South-East (L.B. Nagar, Hayathnagar, Pedda amberpet, Ibrahimpatnam,Ramoji Film City area and surrounding areas). These 5 Universities shall provide admissions in the concerned PG courses through TS PGECET 2019. Candidates can check the list of the participating institutes given below for a reference. 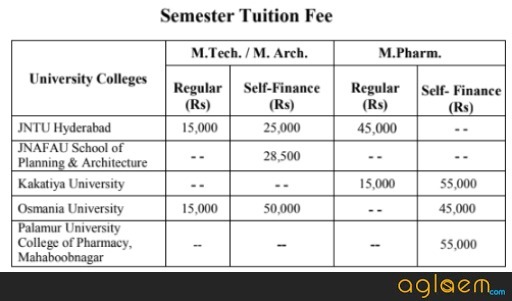 The below fee structure semester wise is based on the last year trends. Fee details are different for the GATE candidates and Candidates belongs to TS PGECET-2019. Candidates can go through the semester fees for their concerned courses and colleges that will be allotted after the counselling round from below. 1. GATE/GPAT candidates are NOT ELIGIBLE for Reimbursement of Tuition Fee. For more information candidates can check TS PGECET 2019 Information Booklet.